MANILA, Philippines - K-pop group 2NE1 will be included in the new album of The Black Eyed Peas' frontman Will.I.Am. Will.I.Am will be releasing his fourth studio album "#willpower" in the US on April 23 and it includes some of the biggest names in music. For his new album, Will.I.Am included songs he recorded with Justin Bieber, 2NE1, Britney Spears, Black Eyed Peas' apl.de.ap, Miley Cyrus, Lil Wayne, Hit-Boy, Waka Flocka Flame, Diddy, Chris Brown, Skylar Grey, Juicy J, Nicole Scherzinger, Eva Simons and Baby Kaely, according to Billboard. Ahead of the album, Will.I.Am released "#thatPower" featuring Bieber on March 19 on iTunes. Last year, Will.I.Am and 2NE1 collaborated on the song "Take The World On," which was used in an Intel commercial. The full version of the song was released recently. It is not yet known if the song is the one included in Will.I.Am's album. 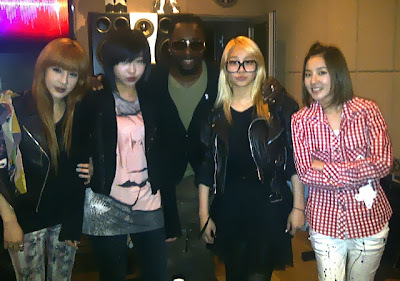 2NE1's inclusion in the Will.I.Am's album will be a big help to the K-pop group, which is planning to debut in the US. Last year, it was reported that Will.I.Am would produce 2NE1's US album. Fans are hoping that 2NE1 will release their Korean comeback album soon. 2NE1's last Korean mini-album was "Nolza," released on September 2011. Last year, the group released a single "I Love You." In an interview with Billboard last month, 2NE1's leader CL said the new Korean album was supposed to come out last year. “Last year, we were actually planning to have an album out and we had recorded some songs. But it didn’t happen because of our tour. We had to go on a tour and we had a deadline for if we wanted an album. But it’s just...we couldn’t make it,” she said. She revealed that 2NE1 will be making a comeback in Korea in April. “I feel like ‘I Am The Best’ or 'Can't Nobody' are very much 2NE1’s style, if that’s how you want to put it. ‘I Love You,’ was something different for our fans and for 2NE1. But moving forward, we’re sticking to the original and we’re going to go back to the fun, crazy, different 2NE1,” she added. CL added that she wanted to record a song in English. "I want to so bad. Once the song is out in any language, it’s hard to make it that good in another one. It takes so much energy and time to make one song perfect. But putting that into another language? It’s the same thing, but even more difficult because it has to have the same energy,” she said.